Pantry Boy Review: Does This Crock Pot Meal Delivery Service Deliver? Are you tired of always wondering what’s for dinner? Well, with the plethora of meal delivery services available today, that no longer has to be a stressful question. Previously, you had to plan out meals, create grocery lists, and then make your way through busy grocery store aisles. Now, you can sit back and let someone else do all the hard work for you! Pantry Boy (which started as a successful Kickstarter) strives to make dinnertime fast, simple, and delicious. They provide you with a recipe and the necessary ingredients to whip up something good! All you have to do is toss everything into your slow cooker or prepare your meal on the stove top or in the oven. It doesn’t get much easier than that, does it? If you’d love to have dinner ready without much hassle, let Pantry Boy come to your rescue! In this review, we’re breaking down the steps of joining their meal delivery service, sharing the types of food they have to offer, and more. Keep reading to find out if Pantry Boy is going to be your best friend come dinnertime! To get started with Pantry Boy, you’ll need to first choose between one of their three boxes. At this time, they offer plans for carnivores, omnivores, and vegetarians. The Carnivore box provides you with ingredients and recipes that include meat for every dish. It will also sometimes include seafood options for you to dine on. When you select the Omnivore box, you’ll receive recipes for two meat or seafood options, plus one vegetarian option. This is perfect for anyone who likes to go meat-free on occasion. And of course, the Vegetarian box will provide you with everything you need to cook up three delicious vegetarian meals during the week. Once you’ve chosen your perfect box, you’ll need to select from a couple options. You’ll be prompted to decide how many people you will need to feed with each meal. All three boxes allow you to choose between two people or four people. Be sure to choose the right one so you receive the correct amount of ingredients! Next, you need to choose your delivery date. To do this, you’ll need to input your zip code to see which options are available to you. A calendar will pop up where you’ll see the upcoming available dates. Select the one that works best for you and then you can count the days until its arrival! Pantry Boy provides an array of dishes that can all be prepared in a slow cooker. This allows you to toss everything in and let it cook while you go about your day. It’s really so simple! Plus, the variety of dishes they have to offer ensures even the pickiest of eaters in your family will find something they love. When you view the week’s menu, you’ll find dishes such as Meatballs with Chickpeas, Arroz Con Pollo, and even a Classic Minestrone. The Meatballs with Chickpeas puts a gluten-free twist on a traditional spaghetti with meatballs dish. And the Arroz Con Pollo makes for an easy dinner with chicken thighs, Spanish rice, green peas, and stewed tomatoes. For vegetarians, you’ll find dishes such as: Italian Garden Stew, Stuffed Portabella Mushrooms, Mediterranean Spaghetti, Chickpea Squash Chili, and Shakshuka. There are plenty of options available for everyone, so you’re sure to find a great dinners for you and your family to enjoy. Pantry Boy allows you to view past, present, and future menus so you can see what else they have to offer, plus the recipes for each dish. You can view the recipes to see what kind of ingredients they’ll be sending you way and the cooking preparation that will be involved. As mentioned previously, you’ll be able to select your own delivery date when ordering from Pantry Boy. This is very convenient for anyone who wants to schedule delivery for a time when they may be home during the day. It also allows you to plan your weekly dinners accordingly since you’ll know exactly when your box will arrive. Delivery happens from Wednesday to Saturday each week. You can expect your box to arrive between 9 am and 8 pm in most areas. This ultimately depends on when the carrier arrives in your neighborhood. In some locations, Pantry Boy also offers Tuesday deliveries. You’ll see your available delivery options when you input your zip code at checkout. The good news is, you don’t have to be home in order to receive your delivery. You don’t have to sign for it, so the carrier will leave it on your doorstep. So, if you work all day and won’t be able to get home until the evening, there’s no need to stress that you’ll miss a delivery. You never have to worry about your food not being fresh when it arrives on your doorstep. Pantry Boy has taken the necessary steps to ensure your food is well-kept during transportation. They use insulation and ice packs to keep everything cold and safe for consumption. They do recommend that all food within your box should be consumed with three to five days of arrival, so you should plan your dinners accordingly once receiving your box. Because their ingredients don’t contain preservatives, their shelf-life is shorter. Pantry Boy also says seafood should be eaten first, so you’ll want to make that your first meal of the week should you order any seafood dishes. All of the packaging and materials used are 100% reusable and/or recyclable. Please keep this in mind before disposing of your box and its packaging contents. You can always recycle the box and other items at your local recycling station. When you order from Pantry Boy, you can expect to receive farm-fresh ingredients that are also free from preservatives. They strive to provide their customers with high-quality ingredients to make each of their dishes. There’s no need to wonder where something came from or whether or not it’s really safe for you to consume. They’ve packed only the best into their boxes. And, as mentioned above, everything is kept cold during transport to ensure it’s safe for you to eat once it arrives on your doorstep. Through the help of insulation and ice packs, each ingredient remains fresh and ready for you to enjoy. There’s no need to be a professional chef to whip up a great meal when you have Pantry Boy. They’ve made it easy for anyone to cook something that’s delicious. The best part is that it won’t take you much time at all because they’ve designed these recipes to quick and easy to prepare. For each meal, you have two cooking options. You can choose to use your slow cooker or use the stove top or oven. 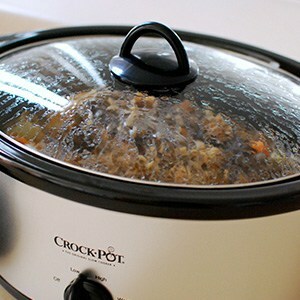 Using the slow cooker will allow you to add your ingredients and walk away while your dinner cooks. This gives you the opportunity to go about your day without having to attend to things in the kitchen since it’ll cook for a few hours. Alternatively, if you choose the “fast cooking” method with the stove or oven, you can expect your meal to be ready in around 30 minutes. Each recipe includes detailed instructions for both options so you can choose which one works best for you. There are no step-by-step instructions for the cooking process, but they’re still easy to follow along with. You’ll also find a list of ingredients, cooking times, and kitchen must-haves. Those kitchen must-haves include things like salt, vegetable oil, and olive oil. It is assumed you have some basic things in your kitchen before getting started. Pantry Boy encourages you to have a slow cooker, since that’s the preferred way to cook their meals. However, if you’d prefer to use the stove top and oven, you can do that too. You will also need things like: pots, pans, serving utensils, knives, cutting boards, strainers, ingredient bowls, and serving plates and bowls. For food items, you’ll want to keep salt, pepper, eggs, and milk on-hand in case a recipe calls for them. Of course, what really matters in the end is how each dish tastes. And it’s safe to say that Pantry Boy has created some pretty delicious recipes for their customers to enjoy! With fresh ingredients and creative dishes, you’ll look forward to dinner every night. Plus, you never have to worry about getting stuck in a food rut because the options they have for you to choose from are sure to keep you excited. Their Spaghetti Alla Caprese is a nice twist on your usual spaghetti dinner. It contains ground beef that has been marinated with garlic, tomato paste, and their house seasoning. It’s flavorful and tender. The red onions, peppers, and cherry tomatoes in this dish complement the seasoned ground beef perfectly. If you want to add a little heat, some crushed red pepper really takes the dish to the next level. The Pork Medallions & Vegetables makes for another weeknight favorite. You’ll love the pork tenderloin tips that have been marinated with parsley and house seasoning. The pork they’ve used is both fresh and juicy, never tough. This dish also contains ripe cherry tomatoes, onions, and potatoes. Although it’s great on its own, Pantry Boy suggests using the leftovers to create a delicious sandwich. Another dish you’re sure to enjoy is their Garlic Ginger Beef. You’ll receive beef cubes that have been marinated with onion, ginger, garlic, curry, bay leaf, tomato paste, and house seasoning for maximum flavor. Paired with basmati rice and a tomato cucumber salad, you’ll want to eat this one again and again. Plus, it’s perfect for those who are nut-free and gluten-free. So, how much does Pantry Boy cost? How much you wind up paying for your box will depend on which one you order and how many servings you need per meal. The Carnivore box starts at $62.34 when you order for just two people. If you have a family to feed and need extra servings, you’re looking at $124.68 to serve a family of four. The Omnivore box will cost you $58.14 to serve two people. If you need to feed four, the cost of your box comes to $116.28. And finally, the Vegetarian box will cost $53.94 for two people. For four servings, it will cost $107.88. This makes the Vegetarian box the cheapest overall option. You might be wondering if this is more expensive than shopping at your local grocery store. Pantry Boy doesn’t think so! They’ve designed their boxes to be more economical than typical grocery shopping. Given that there is so much food waste today, they aim to cut down on that because you’ll receive the exact proportions you need for each recipe. They also don’t have added costs like overhead and liabilities, which ultimately saves you in the end. Don’t forget you’re also able to skip a week whenever you need to if you need to take a break from your Pantry Boy subscription. You can also cancel anytime you need by logging into your account and doing so. Your subscription with them is totally up to you and you can make it work for your needs. If you’re looking for a way to make dinnertime easier, Pantry Boy is certainly one meal delivery service to consider. You’ll receive fresh ingredients and and recipes delivered straight to your doorstep for you to whip up in your own kitchen. It’s especially perfect for any of you who love using the slow cooker! 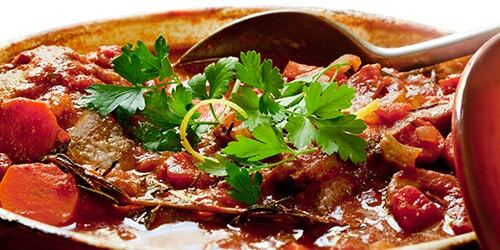 Each one of their recipes is designed to be prepared in a slow cooker, making cooking preparations even easier. So, if you’re a slow cooker fan, this just might be the box for you. Instead of stressing about dinnertime and letting it because a nightly hassle, allow Pantry Boy to do the hard work for you. They’ll send you meal options and provide you with the pre-portioned ingredients you need to create a dinner that’s delicious and filling. PantryBoy is the best crock pot meal delivery service that we've reviewed. They are reliable, plus their ingredients are quality and priced well. If I were Pantry Boy, I’d be embarrassed by my product. Rather than go into all of the specifics of each meal, here are some general trends. 1) Meals are horribly bland, sometimes to the point of being inedible – yes, we’ve opted to throw meals away and make something else for dinner, what a waste. It’s as if the recipes were developed by someone who has never tasted food before. I’ve had dollar store microwave meals that taste better. 2) Every meal had something wrong with the ingredients, often more that one thing wrong (e.g., meat that was supposed to be marinated but wasn’t, missing ingredients, spoiled ingredients, ingredients spilled out of their packaging onto others). 3) Directions are inconsistent and, sometimes, contradictory. 4) Recipe photo in no way depicts what you actually receive. 5) One box was barely cold – everything would have been spoiled had it sat on my porch for even an hour longer. I have tried other meal delivery services and Pantry Boy is, by far, the worst I have ever experienced. Ultimately, I wish I wouldn’t have wasted my money on this poor excuse for a meal delivery service. Hey Kara, I’m so sorry to hear this! Did you reach out to them to possibly get a refund?